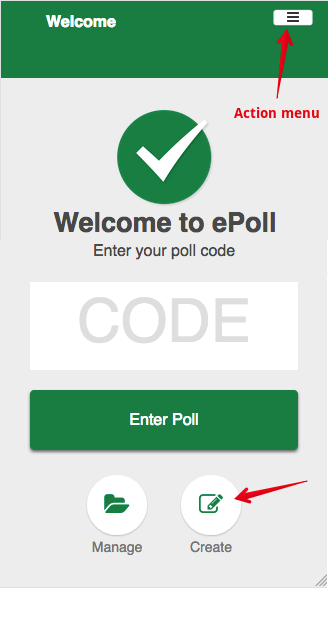 ePoll is the University of Alberta's web-based student response system (SRS), which allows instructors to conduct live student polls within the classroom. ePoll was constructed to provide existing SRS users with a free alternative to clicker-based systems while also allowing students to use their own devices. ePoll is currently in public beta phase with all users welcome. Anyone with feedback about the system is encouraged to contact the IST eClass team. ePoll is designed to be used in a course already using i>Clickers, with the assumption that an instructor will already have their question prompts inserted as slides into their lecture presentation. Students access the tool in a mobile browser and enter the Poll ID to access a session. It is also possible to prepare lists of question and answer prompts in advance and to record both student participation and performance scores. The Welcome screen allows participants to Enter polls by typing the session code; Instructors can Manage past sessions (including viewing past session results), and Create new polls. The action menu at the top right shows the logged in account and has the logout button. To begin polling click Create. The default poll name is the current date and time. The Poll ID must be entered by students to access the poll. If using a mobile phone, the Poll ID must be displayed somewhere in the classroom: for example in the lecture powerpoint slides or on the whiteboard. 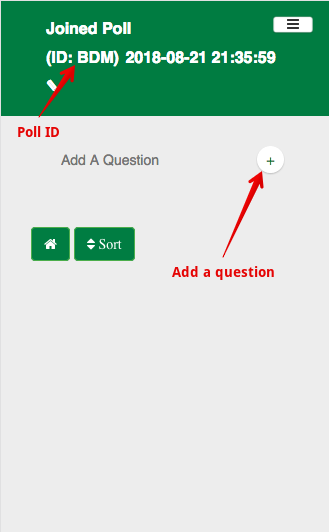 If using the classroom podium computer to display ePoll in a browser, students will see the poll code in the question header. To add and launch a question, click on the Add question button. For a quick question matching an existing lecture slide, all that is required is a name for the question, eg. Q1 and to adjust the number of answers to match the slide. To edit the question name, tap or click 'Question text'. If nothing is entered, the default question name is the current time. Multiple choice question type with 5 answers. No answers can be counted as correct. To open the question for student responses, click the Begin polling button at bottom right. While polling is running, the instructor will see the current number of responses under the question name. 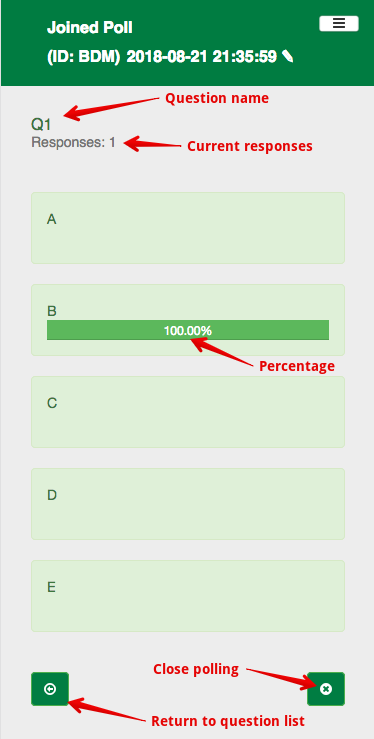 The percentage of responses for answer displays in the bar graph for each prompt. Question polling can be closed by clicking End at the bottom right. Doing this will provide the option of showing the answer summary on participant devices. Close the question and return to the question list by clicking Back at the bottom left. 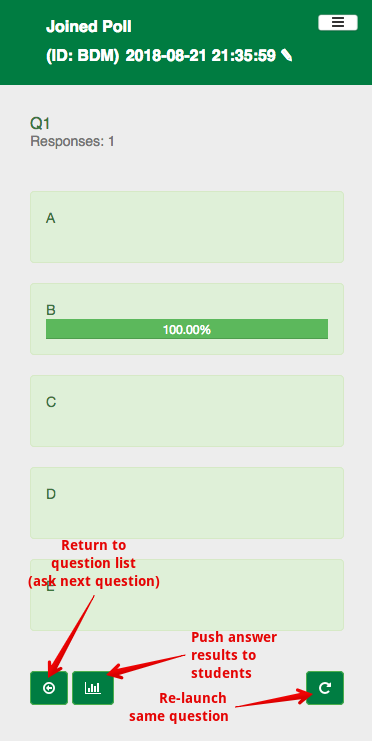 From within a closed poll question, the overall class results for the question can be pushed to student devices by clicking the results button. Instructors can click the Re-ask button to re-launch the same question (deleting any existing responses). The Back button allows instructors to ask a new question matching the next slide in the powerpoint. View the results of past questions - which provides the option to display them to students. Add new questions and launch them for polling. Duplicate questions - which provides the ability to edit them before launching. Clicking Home on this screen will exit the poll and display the list of existing polls. The quick polling method described above is best used for on-the-fly questions live in class or with questions already existing as slides in your lecture notes or powerpoint slides. 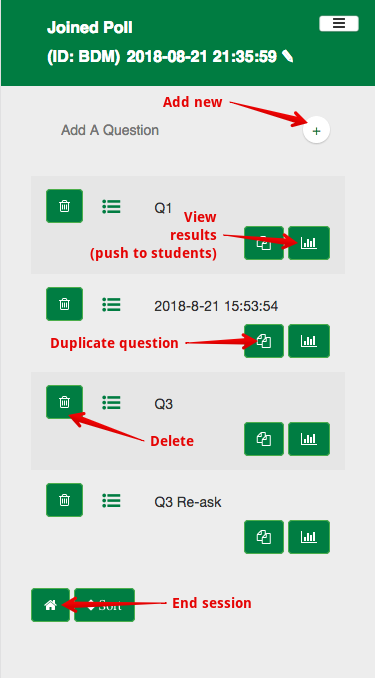 As an alternative, it is also possible to build questions out in advance in ePoll which can replace the need for specific slides in the lecture notes - for more information please see Creating and Managing ePoll Questions.